What follows is a detailed description of Steven Stern's recent two-week cruise on Viking Ingvi from Budapest to Amsterdam. A review of his two-week cruise from Bergen to Athens on Viking Sea will follow. Stern's Guide to the Cruise Vacation is awarding 6 stars in the deluxe premium category to Viking Ocean Cruise ships. This follows the news just last month that readers of Travel & Leisure magazine had rated Viking as the Number 1 Ocean Cruise Line in the world. We began our journey in Budapest boarding the Viking Ingvi which was docked along the waterfront on the Pest side of the Danube River. The river divides the twin Hungarian cities of Buda and Pest, Pest being the more commercial with hundreds of shops and restaurants, as well as luxury hotels. Representatives of the cruise line met us at the airport and bused us with other passengers to the ship. My first impression of the ship was that it was modern and streamlined with a soft, pleasing décor. We were greeted by the program director and the hotel manager, two of the friendliest and most conscientious we have encountered. We had booked one of the 205 square-foot Veranda Staterooms which we found a good value for the price. Obviously the more expensive 275 square-foot premium Veranda Suites and the two 445 square-foot Explorer Suites afforded a greater degree of comfort and luxury. After unpacking we ventured out into the city. Since the ship would spend the first and second day of our trip in Budapest, we had plenty of time to explore the numerous places of interest and to partake of a typical Hungarian meal. 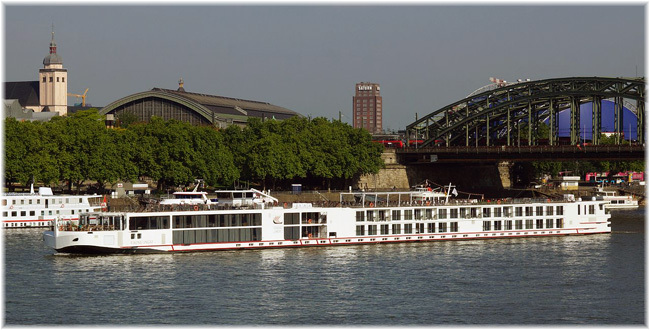 The Ingvi is a sister ship to the dozens of 190-passenger "long boat class" Viking riverboats entering service since 2012. Three-quarters of the staterooms on Ingvi have a full veranda, a French balcony, or both. All staterooms include hair dryers, electronic safes, refrigerators, colour televisions with a selection of channels, CNN and on-demand movies, and both 110v and 220v electrical outlets. Laundry service is available for a fee. Complimentary bottled water is refreshed daily and ice machines are located on each deck. Public spaces include the reception area with information and concierge desks, the open seating main dining room serving all three meals, an all-purpose lounge and bar, the venue for lectures and entertainment, the sun deck with lounges, a walking track, shuffle board and an herb garden, a small library with two lap-top computers, and the Aquavit Terrace at the bow of the ship where a light breakfast and lunch are served both indoors and al fresco. Complimentary house wine, beer and soft drinks are available during lunch and dinner service but incur a charge outside these hours. Special drink packages were available for passengers expecting to do some serious drinking (alcoholic and non-alcoholic). Passengers can bring local wines aboard with no corkage fee. Dress is country club casual throughout the cruise and men are not required to wear jackets. Currency aboard ship is the euro and a Û12 per day gratuity for the ship's staff and a Û2 per day gratuity for the program director is recommended and can be added to your bill. I have to admit that we were somewhat disappointed that there were no fitness room, sauna, swimming pool, self-service laundry facilities, or bicycles aboard the ship. As in each port throughout the cruise, a complimentary tour was offered which provided an excellent introduction to all of the important sites in both Pest and Buda. Optional tours were offered at each port for a fee. The optional tours offered here included a drive to Lazar Equestrian Park to view some exciting horsemanship by highly skilled riders, a walking tour of the Jewish quarter to explore Budapest's Jewish history, and a chance to experience the famous Budapest thermal baths and soak along with locals bathing in an array of thermal pools. We had taken the thermal bath at one of Pest's largest facilities on a prior trip and frankly found that although it was very interesting to observe, we weren't that thrilled getting so close to the natives. Budapest is at its most spectacular at night when the bridges are lit up, a great photo opt. Before dinner each evening, the knowledgeable cruise director gave an informative talk covering the ports and programs for the following day, as well as a description of the optional tours. We found the entire tour program well organized, with exceptional guides and numerous alternative choices. However all of the optional excursions incurred a significant charge, many of which were offered free of charge by other cruise lines. Dinner consisted of several choices of appetizers, soup and salads, three entree selections including a vegetarian offering, and five dessert options (including fruit, ice cream and cheese). In addition to each nights changing menu, passengers could order rib-eye steak, chicken or salmon. Also, out friendly chef would occasionally honour special requests for items not on the menu. Breakfast and lunch were offered either buffet style from a variety of selections or from a menu with table service. A lighter version was available on the Aquavit Terrace. Coffee, tea and specialty coffees along with bakery items were available throughout the day in an area outside the lounge. Service in the restaurants, and throughout the ship was friendly, concerned and exceptional. After dinner, a talented piano player provided music for listening and dancing in the lounge, and on several evenings local entertainers were brought aboard. The availability of local performers was controlled to an extent by the location of the ship and the time it had to leave a port to accommodate its appointments to pass through the numerous locks along the rivers. As a result, we had little entertainment during the first week of the cruise. At best, entertainment on riverboats is a far cry from that found on ocean-going ships. Actually the most fun evenings were the audience participation events. As we proceeded down the Danube, our next stop was Austria's capital city of Vienna, Europe's center of classical music. We arrived early evening in time for passengers to take the optional excursion to visit the Vienna Residence Orchestra for a special performance of selections from Mozart and Strauss. The next morning the included familiarization tour was a bus ride around the city past elegant public buildings, grand residences, Hofburg Palace, St Stephan's Cathedral and the Vienna State Opera. We joined some of the passengers for a "close up" alternative, to do the tour on foot. Chargeable options included a tour of Schonbrunn Palace, a visit to the markets with the chef with tastings, and an evening drive to the outskirts of Vienna to a vineyard to enjoy a dinner of local dishes and wines along with traditional music. With two days and nights in Vienna, there was plenty of time to enjoy many of these tours. We also had time to explore the main shopping streets near Stephanplatz with their numerous shops, restaurants and small cafés. Like many tourists, we could not resist the tourist tradition of visiting the Sacher Hotel to sample the famous Sachertort. The following day we traversed the most scenic portion of the Danube. This stretch from Vienna to Passau, past the Wachau Valley meanders through a succession of narrow valleys and emerald-green hillsides dotted with vineyards, fortresses, baroque castles, and charming little towns. Along the way, the ship made a stop at the village of Melk to allow passengers to visit the Melk Abbey, a masterwork of Baroque brilliance perched on a cliff above the river. Built during the 12th century it was destroyed by fire, but rebuilt during the 18th century. The Danube then flows through the city of Passau, our next destination. Included was a walking tour through the old-world streets of the city, terminating at the17th century St Stephen's Cathedral for an organ concert on Europe's largest pipe organ (having done this before, it was a somewhat boring concert to be missed). A desirable full-day optional tour was to Salzburg in Austria, one of Europe's most charming cities. The tour included lunch along with a production of the Sound of Music. For those who had never been in Salzburg, this was definitely the best choice. Our next stop was at Regensburg. This is one of Germany's best-preserved cities dating back to 77AD. Remnants of the Roman occupation can be seen at the ancient Prota Praetoria behind the Gothic cathedral and at the Steinerne Brucke (the oldest bridge in Germany.) A popular tourist tradition is sampling the wurst and sauerkraut at the Old Sausage Kitchen below the Steinerne Bridge. Included was the walking tour of the city. Options were a full-day excursion to Munich and a visit to the BMW automobile factory. Ironically, the Munich tour coincided with the shooting at the Munich mall. Fortunately the mall was not part of the itinerary. This only goes to show how dangerous our world is today. The Danube then meets the Main-Danube Canal at Kelheim, the location where the river starts the journey on its path to the Black Sea. Our first destination along the Main-Danube Canal is the city of Nuremberg, an important city in the rise and fall of Nazi Germany. The optional World War II tour takes you to the Nazi Rally Grounds, the fuehrer's Congress hall, the Documentation Center and the venue of the Nazi war trials. If you don't take the tour, a must is the Documentation Center which chronicles the rise of the Nazis and their propaganda, and continues up to the defeat of Germany in the Second World War. The story is told through dozens of short films displayed chronologically as you pass from room to room. Also, this is a good city to visit a local pub to sample the tiny Nuremberg bratwurst along with sauerkraut and beer. Prior to this tour, the cruise director gave a very informative talk on the history of canals and the lock system. During that evening, we were entertained by a trio that described their music as gypsy jazz. Personally, I was not impressed; however, most of the passengers would disagree with me. The last stop on the Main-Danube Canal was Bamberg, a medieval-looking city known for its symphony orchestra and smoked beer. Included here is a walking tour of the city with an optional tour to visit the countryside stopping at a local pub for a taste of the brew. Upon our return to the ship, it began to pour creating a challenge to walk from where the bus disembarked passengers to the entrance of the ship. Typical of the caring service, we were met by the entire crew who escorted each passenger with a large umbrella to dry land. We next entered the Main River for daily visits to the charming towns of Wurzburg and Wertheim with an option to travel to the walled medieval town of Rothenberg. Walking tours were included both days. Wurzburg proved to be a great shopping town with an abundance of department stores, boutiques and specialty shops. In Wertheim, a special Jewish history tour was offered during which the guides recounted their personal family histories under Nazi occupation of the city and the attitudes of their parents during and after the war. The following two evenings, we were entertained by a glass blower and by a classical music duo. We now entered the romantic Rhine where we pass vineyard-blanketed hills, splendid castles and dramatic rocks along tall banks including the legendary Lorelei Rock, where legend tells us a beautiful maiden threw herself into the river over a faithless lover and was then transformed into a siren who mesmerized sailors with her song and lured them to their demise at her feet. Be sure to have your cameras available throughout this scenic stretch of the river. After a pleasant morning enjoying this unique section of the river, we were ready to venture forward at our next destination, the city of Koblenz situated at the confluence of the Rhine and Moselle Rivers. The included tour was to Braubach to explore the medieval Marksburg Castle. Having seen the castle on previous trips, we opted for the Moselle bus excursion past the charming little fairy book towns and vineyards upriver on the Moselle which included a wine tasting. Onward and further up the Rhine we came to Cologne, site of Northern Europe's largest Cathedral, a magnificent gothic structure and a UNESCO World Heritage Site. In addition to the included walking tour, other options offered were a visit to Augustusburg Castle in Schlosspark, a chance to climb the 240 steps to the top of Cologne's Cathedral for views over the Rhine, and a visit to a Krolsch brew house to sample Krolsch beer fresh from the barrel. Nearing the end of our cruise, we made our last stop at Kinderdijk, Holland to tour the largest concentration of windmills in the Netherlands including the opportunity to step inside a working windmill to observe its mechanics and living quarters. An interesting option was the tour to a cheese farm to observe how Gouda cheese is produced. The next morning our ship docked in Amsterdam and passengers disembarked. We had previously enjoyed the plethora of sights and attractions this city has to offer. The most popular tourist destinations in Amsterdam include the world famous Rijksmuseum, housing many Dutch and European masterpieces including Rembrandt's The Night Watch, the Van Gogh Museum, The Anne Frank House, the many shopping streets, the coffee houses (that specialize in offering marijuana to their patrons) and the notorious red light district. During our two week journey we passed dozens of Viking riverboats, far more than from any other line. This exemplified the company's dominance in the European riverboat market. During the afternoon we visited the colourful fish, flower and fruit markets along the quay and the group of wooden medieval-style warehouses along the wharf. We then took the funicular railway ride up one thousand feet to the top of Mount Floyen to enjoy the spectacular panorama. More images and info of the "Viking Ingvi"